In a microwave-safe mug, add oil and egg, then whisk with a fork. Add the milk, vanilla, sugar, baking powder and flour. Mix thoroughly until all the ingredients are well combined. 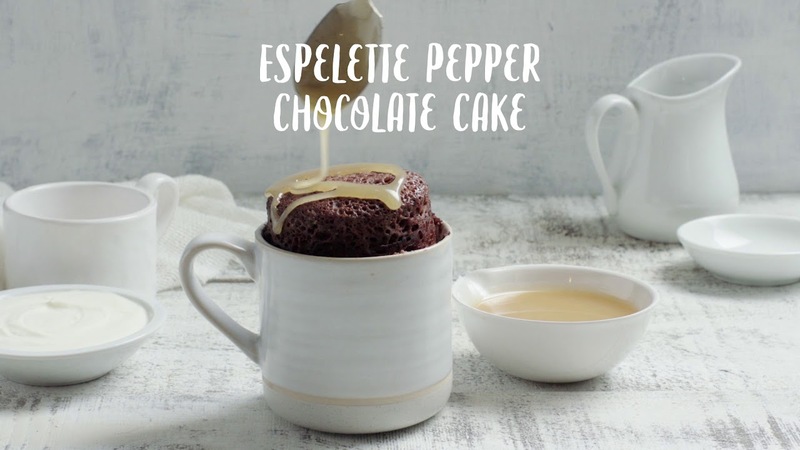 For the chocolate cake: Add the cocoa powder, chocolate chips and Espelette pepper. Mix thoroughly. For the spice cake: Add the cinnamon, nutmeg, ginger and molasses. Mix thoroughly. Place the mug in the microwave and cook on medium power for one minute. The cake should have risen but still be moist and soft in the centre. If the cake seems undercooked, put it back in the microwave and cook for 10 seconds. Repeat as necessary until you achieve the desired texture. Serve hot with cinnamon caramel sauce.